Poland or Polska is just standing for the term of a flat land what it is mostly in reality with wide agricultural fields, big forests and national parks, some mountains in the South-East at the border to Slovakia (High Tatra), small villages and some wellknown big cities like Warsaw, Cracow, Wroclaw or Gdansk. Around 40 million people are living there which are 99,9 % Christians (87 % Roman-Catholics) – only 5,000 Jews and around 30,000 Muslims have still their home in this country with a total amount of foreigners of around 100,000 or 0,27 % of the population (1). So this is nowadays a ethnically cleaned society due to the brutal and fierce developments during the Nazi-occupation between 1939-1945. In former times the population was really much more diverse with a lot of Jews and other nationalities living there what is in my view always better for creating an open society. Poland-Lithunia used to be an important monarchy in medieval times with the capital Cracow, but afterwards for long-time it was governed by foreign countries, divided more than once between other empires with the effect that Polish was more an underground language for centuries, therefore it is also regarded as a quite museal language in the Slavic area because it could not develop freely for long time. The grammar is really complicated, so to learn it is really not an easy task, but some few words like “barzo djekuje” (many thanks) can always be helpful to know for every visitor. Due to the very bad experiences made in history nationalism is quite attractive for Polish people as a political concept, as long this does not mean national egoism and stupidity this is normally not a problem for neighbouring countries. So Polish people or governments quite often look nervously to the West (Germany) or anxiously towards the East (Russia) especially due to the traumatic experiences in the 20th century when in 1939 Germany and the Soviet-Union invaded and occupied the country and divided it in 2 parts where incredible crimes and mass-murders of the local populations took place. Subsequently a lot of matters happening today are a little bit more understandable when looking back in history of this country in the heart of Europe. The town of Lublin is situated in the very South-East of Poland not far away from the border to the Ukraine. The old town is very charming because not all houses are perfectly restored (some even without inhabitants) but instead you will find a lot of old pathes for loafing around, a high diversity of pubs and restaurants which are very crowded in the evening, just real life. Besides there is also an old castle in the centre hosting nowadays a big museum with a lot of important paintings from Polish history. Only a few kilometers from the city centre you will find the former SS concentration camp Majdanek which was finally erected in December 1941 with the original purpose to serve as a camp for war prisoners from the Soviet-Union. However, it was then utilized for other purposes such as accomodating Polish civilians forced to work for the German SS regime. In 1943 and 1944 it served also as a place for eliminating the local Jewish population till the Red Army freed it in August 1944. At least 80,000 people (59,000 Jews) were killed here in the gas chamber, by shooting, due to hard work and inhuman treatment or by disease. 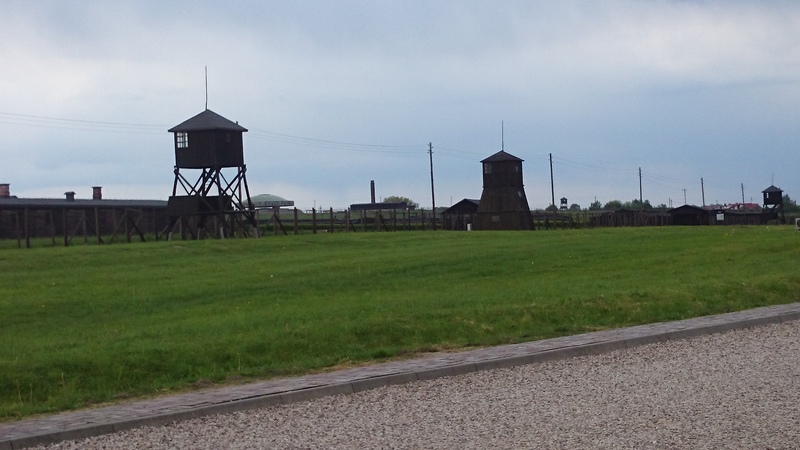 On the photo you see the watch towers, in the background the crematorium with chimney and the white modern memorial monument made out of concrete at the place of a mass-grave. A visit is quite terrifying because the horror is still present in one of the still existing gas-chambers or the crematorium. This kind of industrialized mass-murdering is hardly realiziable for us today at this damned location. So the memorial place outside of the camp therefore shall be a place of honour and remembrance to those who lost their life here at the brink of Europe. Fortunately we today live in different times with open borders between a lot of European countries (the Schengen zone). This is also the case for the border between Germany and Poland which can today be easily crossed normally without any control or delay. However, it must be still quite astonishing for a lot of people in Poland, when the mixed German-Polish chorus Spotkanie from Berlin is making concerts in Poland (mainly in churches) and then performing also a lot of traditional Polish songs like Gaude mater. 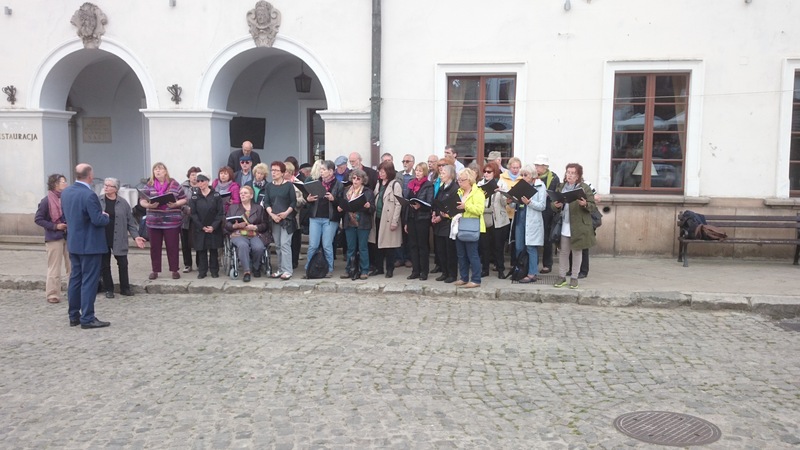 The word Spotkanie is Polish and means meeting each other, so in May 2015 the chorus did a short of performance on the market place of Kazimierz Dolny supported by the dynamic mayor of the town (to be seen on the photo infront of the chorus to the left) who professionally whistled melodies on a simple leaf what was a quite funny situation. Kazimierz Dolny (ca. 40 kms from Lublin to the North-West) is meanwhile regarded as one of the nicest villages in Poland with 2 famous Rennaissance buildings at the market place for instance. 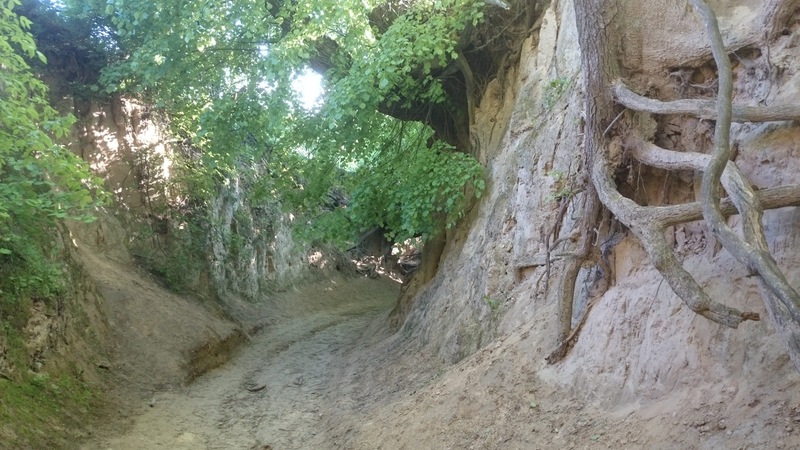 It is also possible to make short boat trips here on the nearby river Vistula. The city of Zamosc is a must for every visitor of this region while it is also called the “Padua of the North” – a UNESCO world culture heritage town being situated around 35 kms from Lublin to the South. The city was constructed (starting 1578) in accordance with the ideas of the Italian master builder Bernardo Morando in the style of the Italian Renaissance. 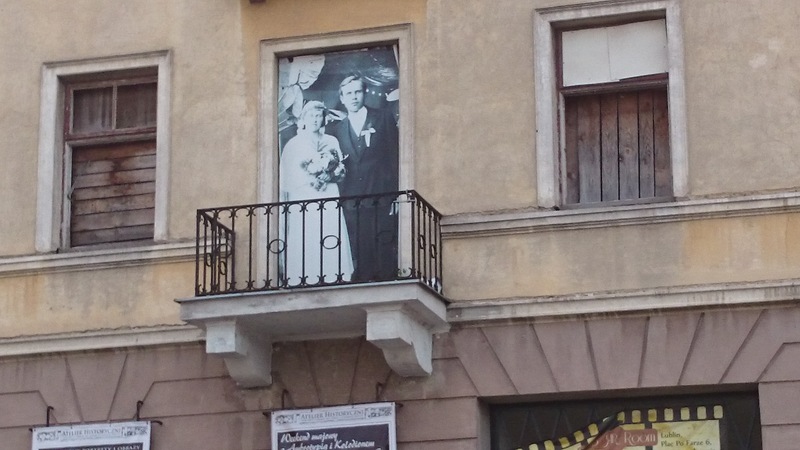 It was founded by Jan Zamoyski in 1576 who was also the name giver of the town – his descendant Marcin Zamoyski was president of the town during the periods of 1990–1992 and 2002–2014. At the big market place it is truly nice to stay in one of the diverse taverns for a coffee or whatever will be individually preferred. 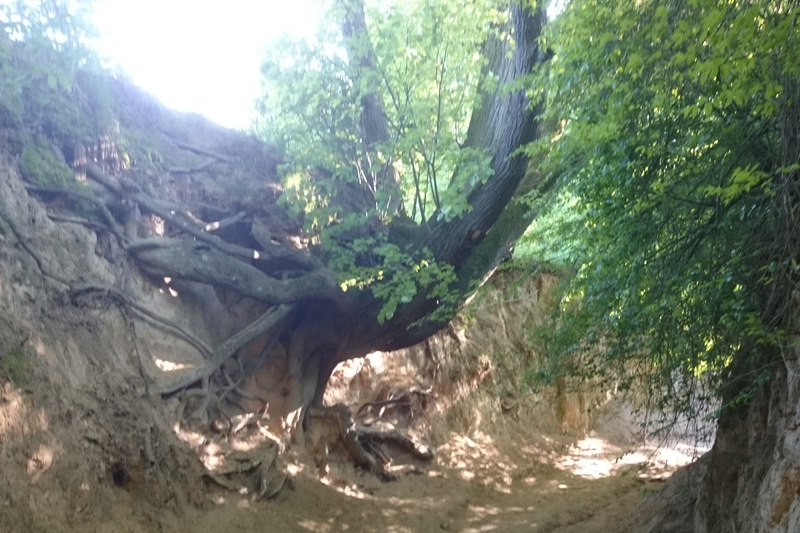 To complete an impression of the region it is also very much advisable to pay longer attention to a natural moment near Kazimierz Doly – the roots gorge created by erosion where you can view a lot of exposed roots created by very big trees in all different shapes. An amazing place for enjoying the subtile powers of plants which are existing much longer than our species on this unique planet Earth. (1) All figures were published by the European statistics authority as per end of 2014. Daß jemand im Angesicht dieses Horrors noch solche Verse schreiben kann, macht mich erst einmal sprachlos. Vielen Dank für diese poetische Ergänzung!